25704LF-SS is rated 4.8 out of 5 by 5. Rated 5 out of 5 by Busivent68 from Very good workmanship This faucet works flawlessly, very smooth, is very handsome and is made with quality materials. 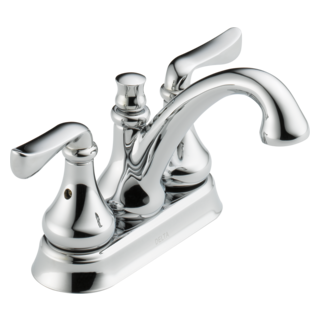 Rated 4 out of 5 by bobyatescity from Buy this faucet It is very nice looking and installation was pretty easy. The pop-up is a direct line pull-up which makes it very easy to put together when installing and it moves easier when using. The faucet has a very heavy feel to it which indicates how it is put together. I am so far very happy with my choice of Delta over Moen. The full opinion can not be made until a couple years go by with my city water running though it. Rated 5 out of 5 by Don19 from Facet is beautifully designed and works wonderfully. Facet is beautifylly designed and very well engineered. Rated 5 out of 5 by Summer from Great Service I always buy Delta faucets as the customer service is excellent, they stand behind their products and are very helpful when you call in for assistance. My Aubrey Faucett sits on the end of an oblong basin. Do you have an extension for the pop up drain that reaches further than the normal one the kit? I am looking for 2 handle Centerset Lavatory Faucets in traditional designs that have a removable stopper. Is the Aubrey one? If not, what models are? Hi Gail, Thank you for your interest in Delta Faucet Company products. All of our stoppers can be installed either as removable or fixed. Why does my Delta 25704LF leak out of the blue body of the drain? The blue body of the drain that connects the sink to the plumbing pipes leaks because of the holes that are on the sides of it. The assembly pictures also show these holes are exposed and thus would create a leak. Did I miss something in the installation? Thank you for your question. Delta Faucet model # 25704LF is equipped with a pop-up assembly with overflow holes. It is possible that your sink does not have overflow holes which would cause a leak. If your sink does not have overflow holes, we do offer a push-pop assembly with no overflow holes with model 72172. Also you mentioned it has a blue body. There is a protective blue cover over the pop assembly to keep it from being scratched during shipping. It does need to be removed for use. What is the base material of the faucet parts? Example all brass. Can they corrode?